Please direct me to the website for proposals for the 2017 conference in August in Helsinki. Thank you for your early interest on our conference! Please check the website eptafinland.fi for more information. The conference website including the registration and lecture proposal forms will open in the beginning of November 2016. I would like to submit a lecture-recital proposal for EPTA 2017. Where do I find more information on this? 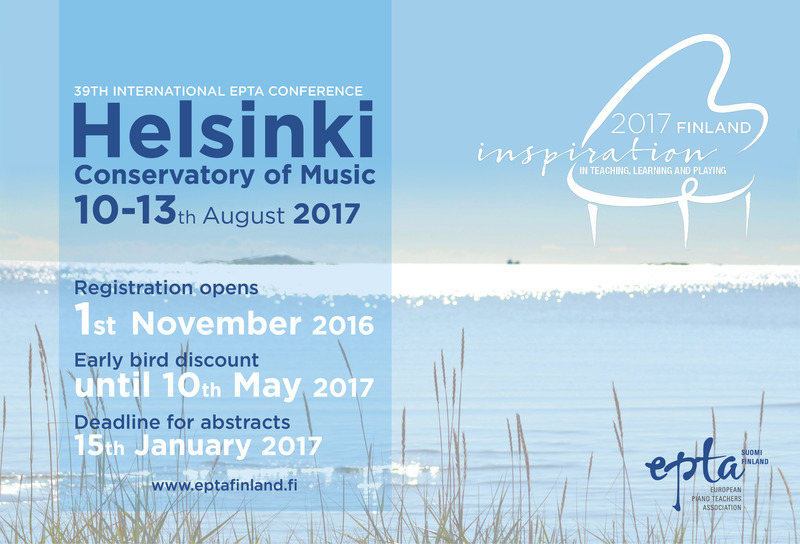 Can you send me registration and lecture-recital proposals for the next EPTA Conference at Helsinki in 2017 ? My colleague Amy Heyman and I are looking forward to attend the Conference in August. We already filled out a registration form, but cannot pay online…. Please inform us how to make a payment for the EPTA Helsinki Conference? We will pay the EPTA member fee because of our MTNA membership. Not sure where to make a payment at EPTA Finland. Can you help? I have registered online on your website to attend the Conference in Helsinky but I have not received any emails nor news back nor confirmation from you. I am a full member of EPTA UK and I have registered before the 10thMay early bird.